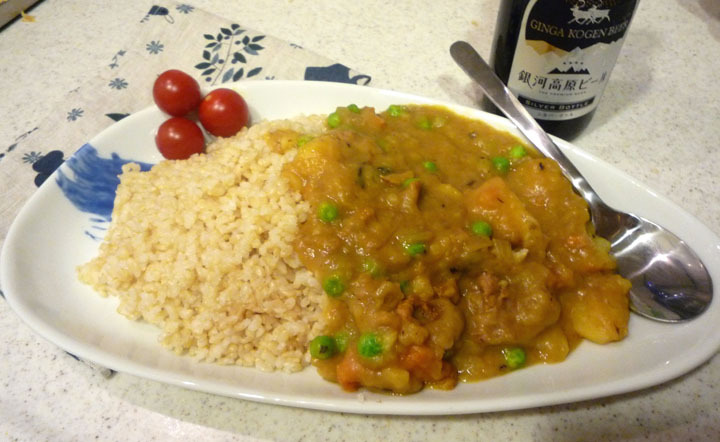 Kare raisu カレーライス is Japanese style curry rice, and my new favorite make-at-home meal. Though somewhat unknown outside of Japan, curry rice is a common dish in these parts. 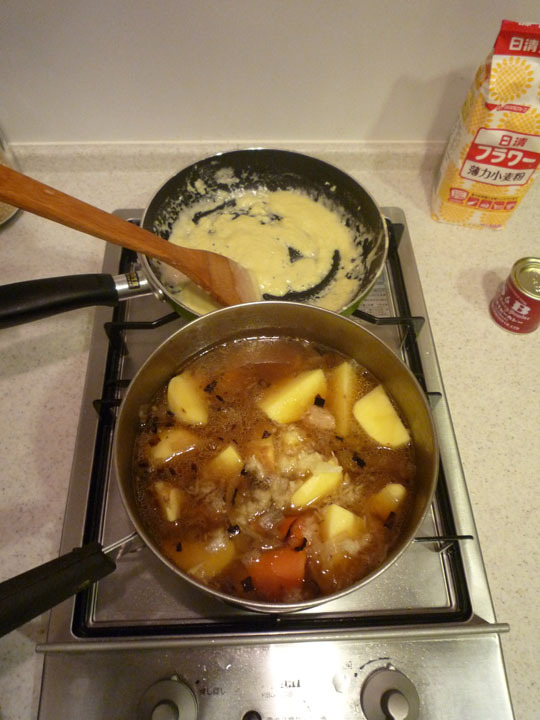 Introduced by the British during the Meiji era (1869–1913), Japanese style curry rice is like Indian curry, though a few steps (colonizations?) removed. It has a rich curry flavor, though is not spicy and usually includes a hint of sweetness. 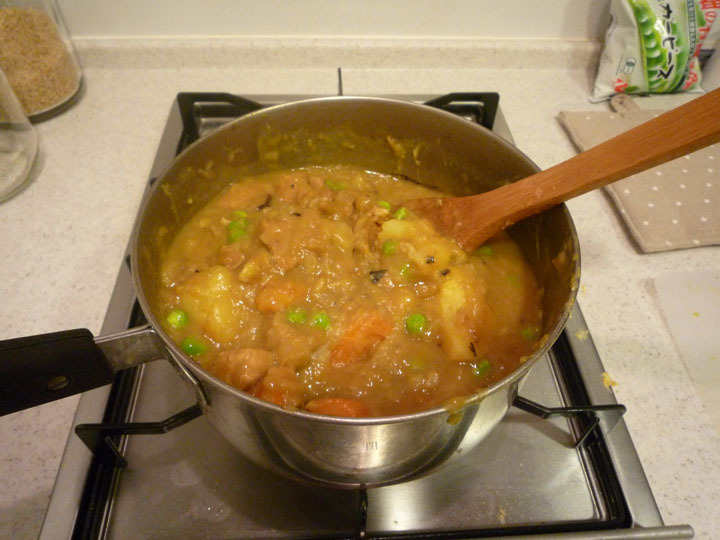 Curry rice can be made with any sort of meat and vegetable combo, though beef or pork with a hearty stock of potatoes and carrots is most common. I love kare raisu, and eat it more than I’d like to admit. It’s a sort of comfort food, like mac and cheese in the United States: it’s warm, filling, and something you can count on to taste good (enough). It has become my go-to when I encounter a menu I can’t fully read, never mind the fact that I usually end up with a giant plate of fried pork in brown sauce, and look around to discover it is the man’s meal of choice. All the other women (and Dan) have beautiful plates of fish, while me and the boys go for the put-some-meat-on-those-bones meat… but I digress. Curry rice is actually quite simple to make, so I decided it was time to try it out for myself — cook up some meat and vegetables and add my choice of curry roux, which come in blocks and can be picked up at the local grocery store. Easy, right? Uh, right. That’s an entire aisle at the supermarket dedicated to curry roux (a comparison of some of them here). After a little more research, I discovered that most of those packages contain a lot of stuff I’m not so interested in ingesting, such as sodium and MSG. 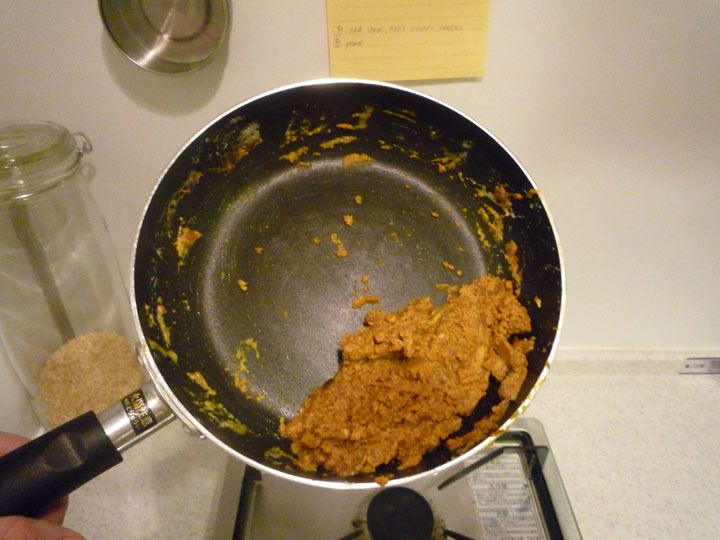 It was time to learn how to make my own curry roux, from scratch. First step, gather the ingredients. Don’t you love it when vegetables play together so nicely? Those of you with a keen eye will notice that yes, I bought discounted meat. What can I say? 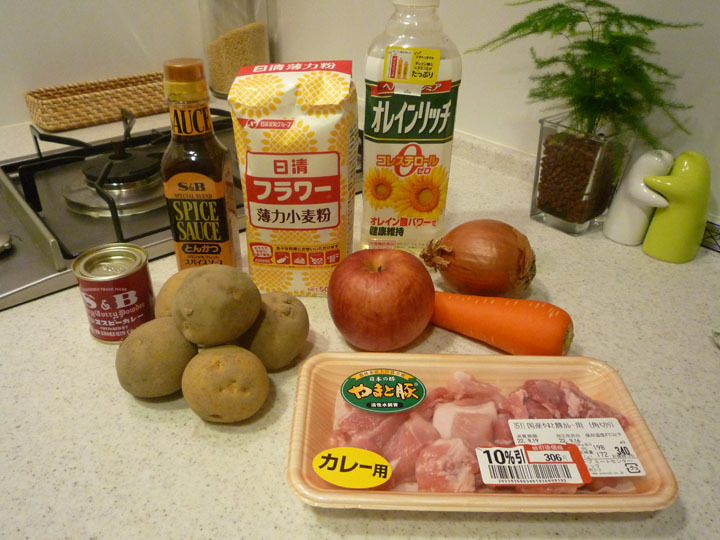 It had カレー (curry) written right on the package, and I was pretty sure it was pork, so the deal was done. I picked up S&B brand curry powder and tonkatsu とんかつ sauce (a brown sauce sort of like Worcestershire, you may remember it from here) because I have no brand loyalty and I like their logo (I guess now I have brand loyalty), and eventually the flour was identified by the flowers on the package — not to be confused with the flowers on the sunflower oil, please! My curry rice was thicker than some, but I didn’t mind. And though it didn’t photograph well, I thought the comforting effect was spot-on. Again, a big thanks to Matsumoto-san at No Recipes for his handiwork. 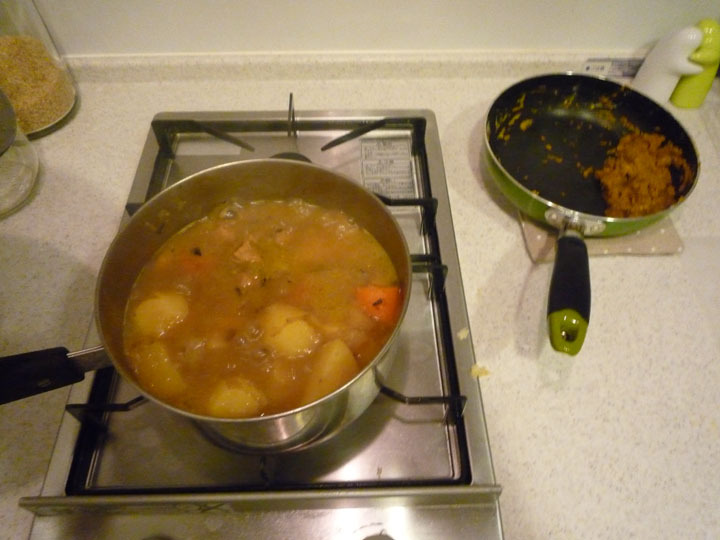 Check out the link if you are interested in making your own curry rice. いただきます! This entry was posted in Food and tagged curry rice, kare raisu, Tokyo, tonkatsu sauce. Bookmark the permalink. Glad you liked it:-) I’m actually in Japan right now and am enjoying your blog! Sounds like a delicious meal — I always enjoy your posts! Yep, looks like you did it! I holidayed in Japan a long time ago and feel certain I would have tried this somewhere at meal time being a bit of a curry lover. Back home I just use the curry blocks we all know and – love??? But now I’ve found your recipe I too am willing to give it a try from scratch. Thanks for posting it.